Fiber and Baryta photo papers are designed to replicate the look and feel of silver halide or gelatin darkroom photo papers. These inkjet papers are extremely popular with those looking to create a wet process look. Fiber and Baryta papers are also known for their ability to reproduce beautiful black and white photographs. 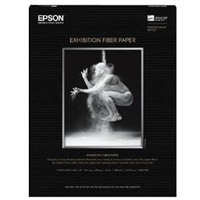 The popularity of Epson's Exhibition Fiber, Ilford's Gold Fibre Silk and Canson Infinity's Baryta Photographique can be seen throughout the photographic print community.